We’re brothers. We’re runners. And that means we’ve been competitive in just about everything throughout our lives. But when we team up together, we’re unstoppable, because we’re determined to be at the top of our game to win your business with our custom finisher medals. After studying economics and business at Villanova University in the suburbs of Philadelphia, Pa., Matt traveled around the world and spent some time in China to learn hands-on the inner workings of international trade and sourcing. The experience he gained was invaluable, working his way from a warehouse worker for the fulfillment company Go East Promotions. In August 2015, Matt formed Stride Awards with his brother Connor and the two didn’t waste time establishing a strategic focus on custom race medals for the endurance industry. 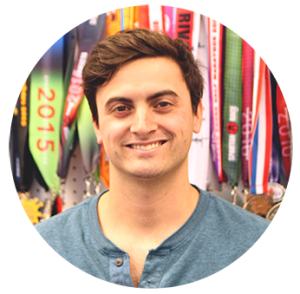 It’s an industry he knows a thing or two about, as a seasoned endurance runner and accomplished track and field competitor throughout high school, before transitioning into CrossFit and bodybuilding exercise. 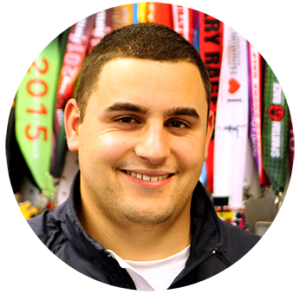 Matt has a strong stamina in sport and work; he’s known for being a workaholic so that each and every customer is a winner – fully satisfied with his or her experience at Stride Awards. Connor was a graphic design major at Elon University, where he was also a Collegiate Division 1 Distance Runner. It’s what has kept his mind running in the endurance industry, for which he’s been working the last four years as a graphic designer. A creative at heart, he’s passionate about partnering with race directors to help brand their events with the most unique, high-quality race medals on the market. When he’s not hard at work, Connor is working hard at training for his first marathon and playing fetch with what he calls “The best Golden Retriever in the world,” Rhody.